The Corrosive Challenge #178 - Shape Up! Yes, I've been busy, haven't I? 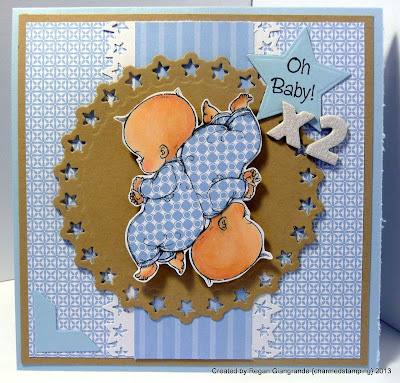 I have another card to share with you, one I created for twin boys, born earlier this month to my neighbor's daughter. My mom made two blanket babies for me to give to welcome their arrival (of course I forgot to snap a photo of them before I sent them off to their new home!) and I made a special card to accompany the gift. The image is Mo's Digital Pencil's adorable Twins. This is the general, non-gender specific version. I paper pieced their jammies and colored the rest with Copics. Papers are from Stampin' Up in Bashful Blue, paired with Crumb Cake (their new name for Kraft) which I seem to be obsessed with lately. 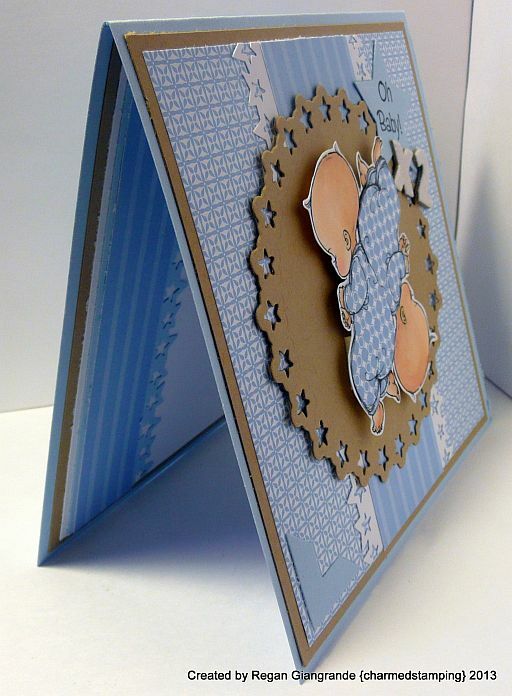 I used the Martha Stewart star border punch as well as two Spellbinders dies (Star Circles and Stars Five). The sentiment is from My Favorite Things and I added "x2" with some Thickers. I popped a corner die cut from Sizzix on the opposite corner for balance. 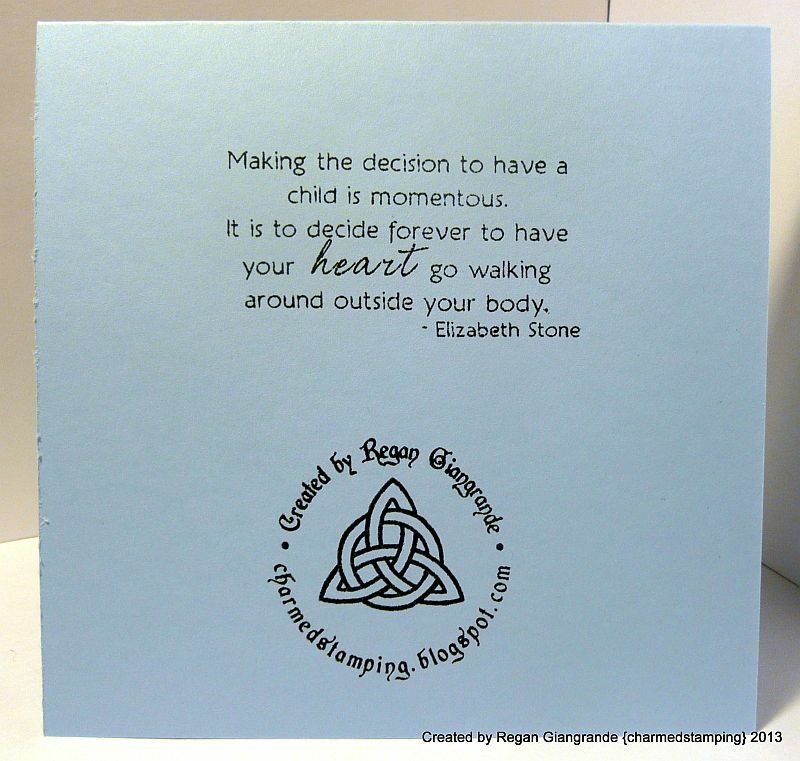 On the back, along with my fabulous customized stamp, is a saying that completely rings true to me since I've had Kayne and I decided to share it with the new parents. The inside greeting simply says "Congratulations" and I wrote a few of my own words to the new family as well. 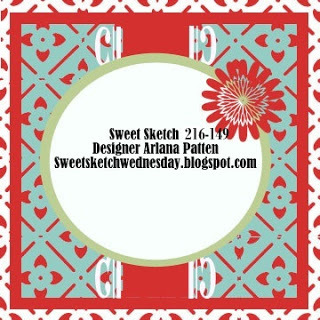 I found my layout over at Sweet Sketch Wednesday (#216). Thanks for stopping by and stay tuned this week over at The Corrosive Challenge for some extra posts leading up to this Sunday's challenge! It's a special one so you won't want to miss out! What a beautiful card. I love your image and I always love paper piecing. 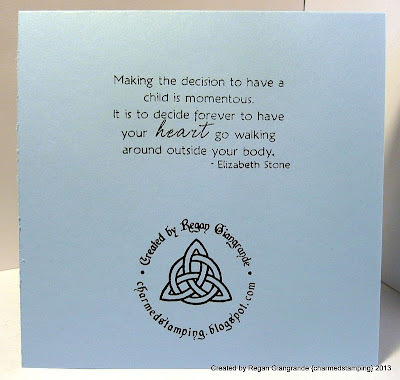 Thanks for sharing your adorable card with us. I absolutely love your twins card! The paperpiecing looks gorgeous and the glittering "x2" is really perfect! Thank you so much for joining our "kraft" challenge at Mo's! Darling! Thanks for sharing this with us over at Sweet Sketch Wednesday! Twins! Double the fun! Thanks so much for joining us this week at Sweet Sketch Wednesday. Awww... So Sweet!! Love the blue and "Kraft", awesome circle die - just love the stars!! So glad you played along with us at Sweet Sketch Wednesday!! This is so wonderful! 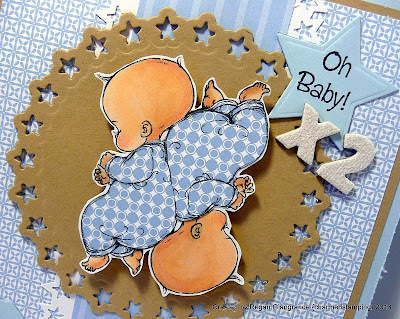 What a fantastic card for twins - love that sweet image. Thanks for joining us at Sweet Sketch Wednesday! Oh this is so sweet and precious. Very soft and soothing, and I love how you completed the inside as well. Thanks so much for joining us at CI Paints this week!